The year is 1838, and seventeen-year-old Julia Elliston's position has never been more fragile. Orphaned and unmarried in a time when women are legal property of their fathers, husbands, and guardians, she finds herself at the mercy of an anonymous guardian who plans to establish her as a servant in far-off Scotland. With two months to devise a better plan, Julia's first choice to marry her childhood sweetheart is denied. But when a titled dowager offers to introduce Julia into society, a realm of possibilities opens. However, treachery and deception are as much a part of Victorian society as titles and decorum, and Julia quickly discovers her present is deeply entangled with her mother's mysterious past. Before she knows what's happening, Julia finds herself a pawn in a deadly game between two of the country's most powerful men. With no laws to protect her, she must unravel the secrets on her own. But sometimes truth is elusive and knowledge is deadly. I first spotted Born of Persuasion on NetGalley, and I immediately went to the author's website to read more about her debut. I was drawn to the summary, and the comparisons to Austen had me even more intrigued. I'm all about anything reminiscent of my very favorite author! Julia Elliston is an orphan at seventeen. She's alone in the world, and it's not a good time or place to be without a trusted protector. Julia finds herself in the care of a nameless and unknown guardian, and he wants to send her to Scotland to work as a servant. She can't imagine anything worse - all she wants is to be able to marry her childhood sweetheart, Edward. Julia travels to Am Meer, the home of one of her closest friends. She's finally close enough to see and speak to Edward, but what has happened in the four years since they last spoke? Nothing is the same was it once was, and Julia begins to unravel as many secrets come to light. As things fall apart around her, Julia decides to take matters into her own hands. She makes an agreement with a wealthy woman who promises to help her make a successful match. It's a decision that marks a turning point in Julia's life and takes her down a dangerous path. While Born of Persuasion has drawn comparisons to Jane Austen, I actually think the book more closely resembles the novels of the Brontes. This is a very Gothic tale, and I didn't think it really resembled Austen at all. The story is filled with drama, and it has a twisted plot that leaves you always feeling a little out of the loop. I thought Julia was an incredibly unreliable narrator - she's naive, too trusting, prone to hysterics and seems completely unaware (or unconcerned?) with proper behavior. Although it's historical fiction, it didn't feel entirely accurate. The inordinate amount of time Julia spends alone with men just didn't quite ring true to me. I'm not a Victorian expert, but I would think that Julia would be more concerned about her reputation (particularly in light of the fact that she has no real protection in the world after the loss of her parents). I was constantly baffled by her behavior, and I found her to be a very frustrating character. Born of Persuasion is Christian fiction, and I was really pleased with the way spiritual themes were more thematic rather than overt or lengthy discussions of faith. There are several elements of the story that hinge of Julia's lack of faith (her father was a well-known atheist) and how it interplays with Edward's faith and role in society. There are several "big reveals" in the book, and I found them surprising but somewhat frustrating. This book relies heavily on all the conflict and angst - and my frustration with Julia didn't leave me very invested in the outcome of the bind she had gotten herself into by the end of the novel. In some ways, I think this read like the Gothic tales that Austen parodies in Northanger Abbey. It has dangerous men, deadly consequences, the potential for comprised virtue, the damsel in constant distress and a seemingly improbable flow of problem after problem. That doesn't mean it wasn't interesting and readable! In fact, I tore through this novel in much the same way that Catherine Morland did The Mysteries of Udolpho. However, it becomes a puzzle that doesn't necessarily make sense, even as the pieces begin to come together. My main criticism is that, while entertaining, Born of Persuasion felt as though it lacked real substance or depth. It was a high-stakes, high-drama read, but in some ways it reminded me of a roller coaster. There's that rush and thrill while you're on it, but the adrenaline fades quickly once you're back on solid ground. 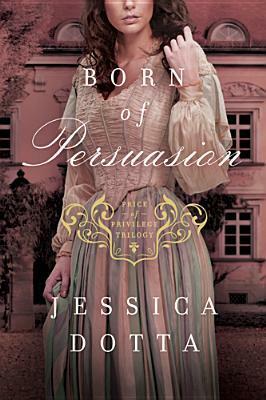 I liked Born of Persuasion, but I was disappointed by the number of inconsistencies that kept me from loving a book that seemed like it'd be a new favorite for me. "I have found that those who try to shield us from the truth, regardless of the reason, end up doing the greatest harm. Truth alone sets you free, not lies and omissions." *I received a copy of this book from Tyndale in exchange for an honest review. I was not compensated in any way for this review. I know, right? I was SO looking forward to this one. I'm really sad I didn't love it more! But yes, focus on those other two. Read em, woman. Bummer! This one sounded fantastic from the summary, and especially when you said it's a gothic Bronte like novel (though I love those Austen books too). However, I try to avoid high drama and angst, and heroines that are difficult to connect with because they do idiotic things. I agree, if she feels trapped and is worried about her future, she should be wiser about her choices. I think I'll be skipping this, but I'm glad you found some good qualities in it overall! I KNOW! Isn't it such a bummer? I was hoping I'd love it. And it wasn't bad - just not quite what I was expecting. I think I could have handled the high drama if it'd had a steady heroine or vice versa... But both? A little too much for me. This one sounds like it could have been SO GOOD, especially based on the summary! However, based on your thoughts, it seems more like a guilty pleasure read than anything else. Yeah, I thought the same thing. It sounded great, so it was definitely disappointing that it was a little all over the place.